WE HAVE BEEN RECONDITIONING POWER STEERING SYSTEMS FOR OVER 25 YEARS AND CONTINUE TO SUPPLY BOTH TRADE AND RETAIL WITH VERY HIGH QUALITY POWER STEERING RACKS, PUMPS AND BOXES. OUR RECONDITIONING PROCESS IS RIGOROUS, WITH EVERY UNIT BEING COMPLETELY STRIPPED, CLEANED, EXAMINED, RE-MACHINED IF NEEDED AND REBUILT WITH NEW PARTS THAT EQUAL OR EXCEED OEM QUALITY. IN ADDITION TO SUPPLYING UNITS WE ALSO FIT UNITS IN OUR WORKSHOP AND HAVE THE LATEST DIAGNOSTIC EQT. TO ENABLE US TO DEAL WITH THE NEW ELECTRIC POWER STEERING SYSTEMS. WE WOULD BE HAPPY TO TALK ABOUT FITTING ON ANY UNIT WE SUPPLY. HS, ZE, KW, IV, PA & BT. SO LONG AS WE GET THE UNIT BACK WITHIN 14 DAYS YOU WILL PAY NO SURCHARGE. IT IS VALID AS LONG AS YOU OWN THE CAR AND IS NON-TRANSFERABLE. A BMW MINI COOPER R53 2001 - 2006. WE MUST HAVE A MOBILE NUMBER FOR ALL SALES BEFORE ANY GOODS ARE DISPATCHED. Unit 6 Hanham Business Park. 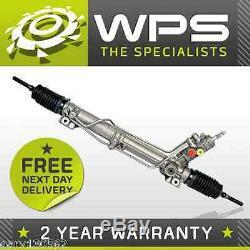 The item "BMW MINI COOPER POWER STEERING RACK 2001-2006 R53 RECONDITIONED UNIT" is in sale since Wednesday, July 31, 2013. This item is in the category "Vehicle Parts & Accessories\Car Parts\Suspension & Steering\Steering Racks & Boxes". The seller is "gary130562" and is located in Bristol. This item can be shipped to United Kingdom.